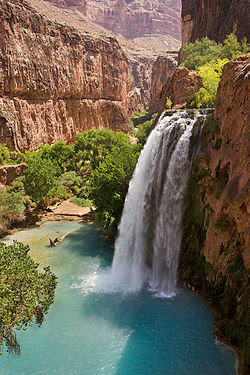 Eas Havasu, faggys da Havasuuw, Arizona, SUA. Ta eas ny lhieggey ushtey çheet er boayl raad ta ushtey roie tuittym harrish boayl eaynagh ny eaynin. Ta easyn coontit mastey ny phenomenonyn smoo aalin 'sy najoor. Ta easyn ennagh ymmydit ayns gientyn pooar ushtey-lectragh.